The Dual-Turbo Twin-Turbo Acceleration technology is claimed to improve the performance of apps by 100 percent, and provide a similar boost for games. A new premium handset from Vivo is coming this month, and it is going to be super fast. 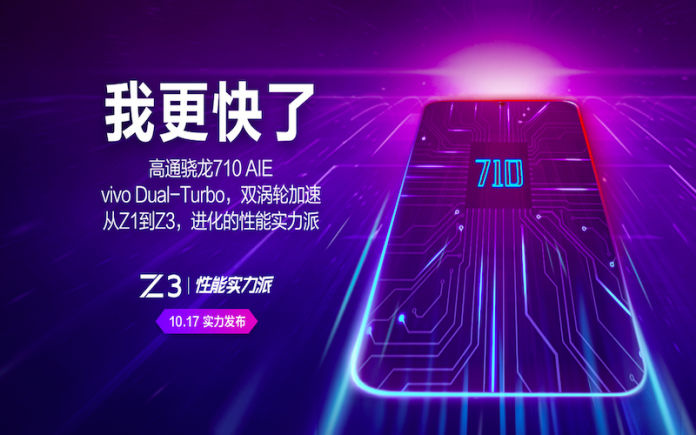 The Vivo Z3 has now been confirmed to launch on October 17, and with Dual-Turbo Twin-Turbo Acceleration technology, which basically means that the handset will be way faster than its competitions in the market. Also, the Vivo Z3 will be powered by Qualcomm’s slick octa-core chipset called the Snapdragon 710 AIE, which is the best new processor that Qualcomm has made, apart from its flagship Snapdragon 845. 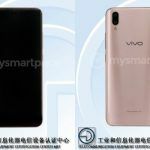 A teaser poster of the handset’s launch has been posted on the official website of Vivo’s flagship store Tmall in China, and it lists the two features prominently. Also, the handset seems to have a waterdrop notch and a high screen-to-body ratio, higher than its preceding model, as we reported earlier. As you can see in the featured image, a full-blown teaser poster has been revealed by Vivo, and posted on its pre-booking page at the website of Tmall, the brand’s flagship store in China. 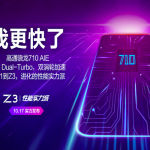 The poster confirms that the new handset Vivo Z3 will be powered by a Snapdragon 710 AIE, and additionally reveals the presence of Dual-Turbo Twin-Turbo Acceleration. 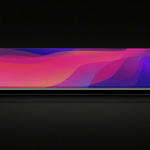 While the Snapdragon processor itself will make the handset much faster and more power-efficient than its Snapdragon 660-powered predecessor Vivo Z1, the Dual-Turbo Twin-Turbo Acceleration technology which is claimed to improve the performance of apps by 100 percent, and provide a similar boost for games. The acceleration technology was developed by Vivo in collaboration with Tencent Game Lab, Netease Game Lab, and Unreal Engine, so the prime responsibility of the Dual Turbo Twin Turbo Acceleration technology is to make gaming a completely flawless and engaging experience on the mobile handset. Even the Snapdragon 710 chipset will make its presence known if you compare the Vivo Z3 with the model it replaces. The Snapdragon 710 comes with Adreno 616 GPU, and delivers 35 percent better graphics than the Adreno 512 GPU we have seen in the Snapdragon 660 chipset. 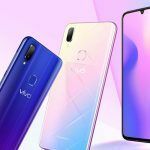 The poster placed on the pre-booking page of Vivo’s store website reveals only a silhouette of the Vivo Z3, and may not be showing the proper end product as it will look. However, some renders were leaked earlier this week and we had reported the development. 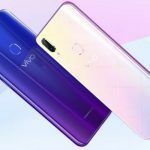 It looks like the Vivo Z3 will sport a 6.3-inch Full HD+ display with a waterdrop notch and a screen-to-body ratio that is higher than 90 percent, following the Halo FullView display design seen on some other mid-range and premium Vivo smartphones. As we now can confirm, the Vivo Z3 will be powered by Qualcomm Snapdragon 710 AIE, and will probably run Funtouch Os 4.0 skin based on Android 8.1 Oreo. 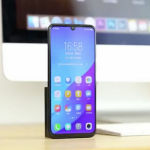 The battery could be the same 3240mAh unit seen on the Vivo Z1, since the new chipset and system turbo will ensure better power-efficiency anyway. There is no sign of a triple rear camera or anything outrageous that is being introduced, so we presume the handset will follow the neat ‘dual-rear camera plus 25MP front shooter technique that has worked well for many of its phones. We shall update the post or write new reports as we find out more about the Vivo Z3, so stay tuned with us. If you have an opinion on the news, do feel free to leave a comment below. Coming from a background in journalism, Sharjeel (not Ahmed) is curious about consumer technology. He thinks Xiaomi is taking over the world, and he is excited about it. He has written feature stories and news reports for Telangana Today, Times of India, Metro India, and a couple of other publications. He tweets at @Sharjeel314, and writes short fiction when armtwisted by his wife.